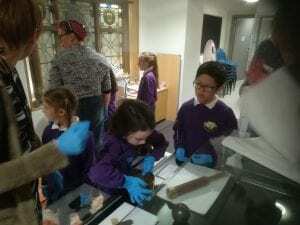 This exhibition has come about due to Braithwaite CE School’s links with Keswick Museum & Art Gallery and a shared interest in learning more about our past. This term the pupils of Catbells Class (aged from 6 to 9 years) have been engaged in a topic of War and Remembrance. This has included finding out about the horrors of the trenches, as well as life on the home front, the role of women & animals, fashion and advances in technology. Understanding the importance of remembrance and being thankful for the sacrifices of others has been a key feature of our work and has encouraged children to ask about their own families, passing the flame of remembrance on to the next generation. 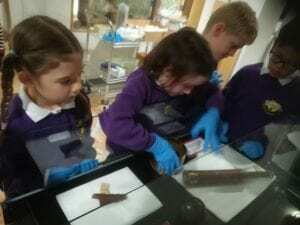 In the process of putting together this exhibition, the children have made visits to the museum, including behind the scenes in the archives, and have carried out their own research back at school. This started with them coming up with a list of questions that they wanted to answer about the artefacts they had chosen from the museum. The children have worked in groups collaborating, sharing out the workload and coming to a consensus about the design of their panel. 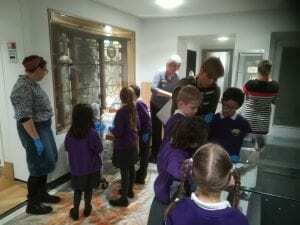 We have to express our sincere thanks to the staff of Keswick Museum & Art Gallery, in particular, Anneke Hackenbroich, Learning Officer, who has worked closely with the pupils on this project, and whose idea this originally was. Thanks are also due to The Friends of Keswick Museum who have funded the work that Anneke has done with us. We are also very grateful to the volunteers and staff who have given up their time to share their knowledge, skills and experience with the children; Becks, Tracy, Mike, Sue, Ros and Stuart, without whom this project would not have come to fruition in the way that it has. We hope that you enjoy your visit to our exhibition, which has inspired the children in their Literacy, Art & Design and History but has given them so much more than just knowledge. This is just a snapshot of what we have learnt on the emotive subject of WW1 and we are really proud to share it with you.